100 gr rice vermicelli, soak in warm water. 2 tbsp vegetable or cooking oil and a lot more for frying. Heat 2 tbsp of oil and saute the seasoning paste until fragrant, add ground chicken and dried shrimp, stir to make sure the chicken is not clumpy. Add jicama or carrots and keep stiring. Pour the chicken broth in, and the rest of seasoning. Let it boil then add the vermicelli. Last add the egg and make sure everything is mixed and no more liquid. Set aside and let it cool. Prepare the lumpia skin, spoon the filling mixture in the center then fold it like an envelope, seal the edges with egg white. Deep fry the lumpia until golden brown. Ready to serve with dipping sauce. I used prepared one that I brought from Indonesia. But you can use store bought Thai peanut sauce or sweet and sour chili sauce. Or any favorite dipping sauce. Could I get this recipe in English please?? 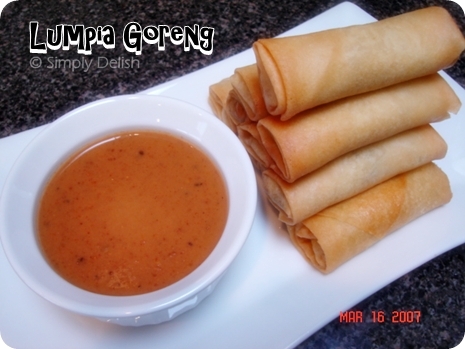 :) I LOVE Lumpias! !